When any electrical appliance fails, the first step is always to check the power supply. Do this using another appliance that you know works. If that fails, take the cover off and check for loose connections. Pay particular attention to the switch and speed control connections. If you find any and have the necessary electrical skills you can re-set the connections. Remember that if you take the cover off you will void any warranty. If your machine is still under warranty, a much better approach is to use the warranty to get it repaired rather than try to find the problem yourself. Another common problem is a build up of gunk and debris in the gears. 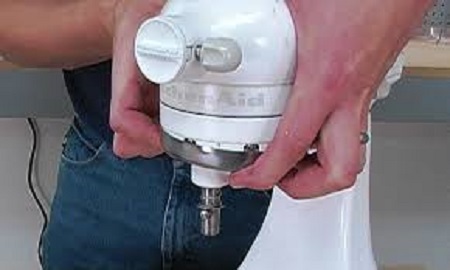 Removing the gunk will often get your food mixer working again. Going through the steps above I got my food mixer going again, but it stopped working just two weeks later. I searched to no avail for a local repairer. In the end, I found someone who did offer food mixer repairs in my area, via the web. Recently, household appliance repairers have started to offer their services online. They are taking advantage of the fact that couriers charge far less than they used to. This means that even with the cost of pickup and delivery the quote for repair was extremely reasonable, so I went ahead and sent it away for repair. It came back as good as new. Following this simple guide fixing a broken food mixer is not difficult. Be the first to comment on "Troubleshooting a Broken Food Mixer"